The sunny summer days and long, warm evenings of the Pacific Northwest make many of us yearn to be outdoors for as long and as often as possible. 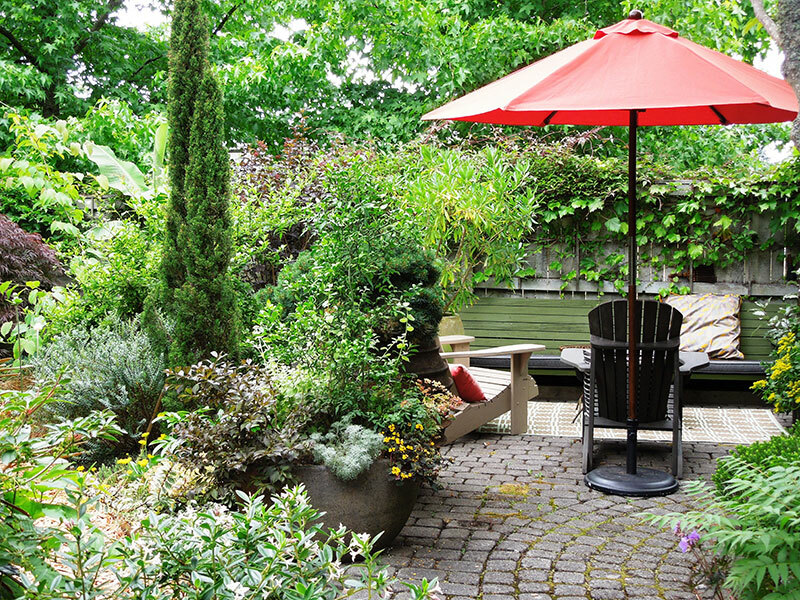 Carving out a patio space in your landscape in which to enjoy our mild maritime climate is a good first step toward achieving this objective. Once you identify the best spot to place a seating area, the next step is to select a surface material for the patio floor. There are many options, and this article provides an overview of three of them—natural stone, concrete pavers, and poured concrete. Start planning now for 2015—you will want to be ready when our next exquisite summer rolls around! Flagstone is a general term applied to many types of natural stone with a flat surface that are used for paving. These stones have names such as Pennsylvania Bluestone, Cowboy Coffee, Montana Slate, and Columbia Grey. Some of them are quarried right here in Washington State; others come from areas such as Montana, British Columbia, or even China. Their color tones vary considerably, from warm browns and lavenders to cool blues and grays. Selecting the stone that will complement both your home and your aesthetic preferences can be challenging. 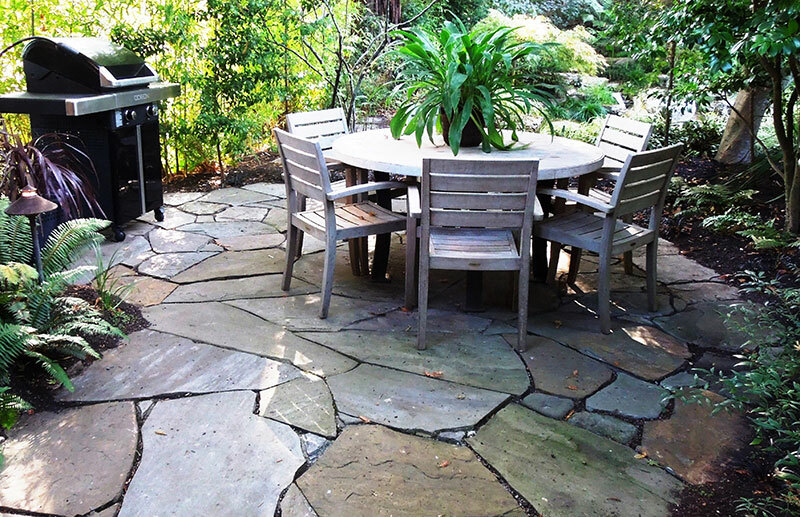 Patio created from large pieces of random-cut flagstone set in sand is stable, yet welcoming. Dimensional flagstone mortared in place offers a formal look. Patio of 12- by 12-inch sand-set concrete pavers sits amid plantings. 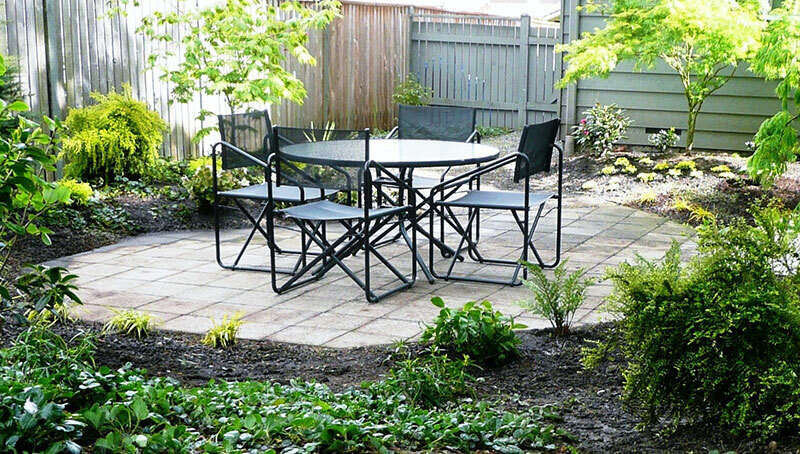 Versatile gray concrete pavers can be arranged in a linear grid or circular pattern. 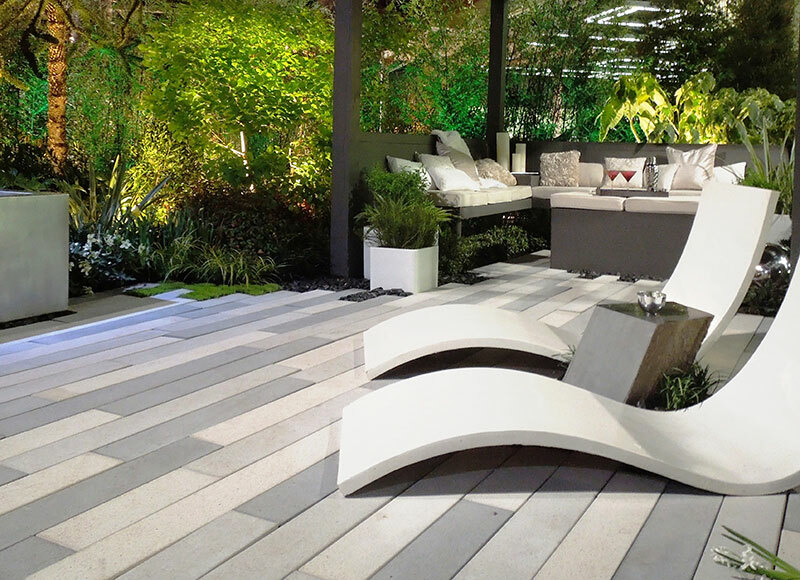 Concrete “planks” were used to very dramatic effect by Sublime Garden Design at the 2013 Northwest Flower & Garden Show. 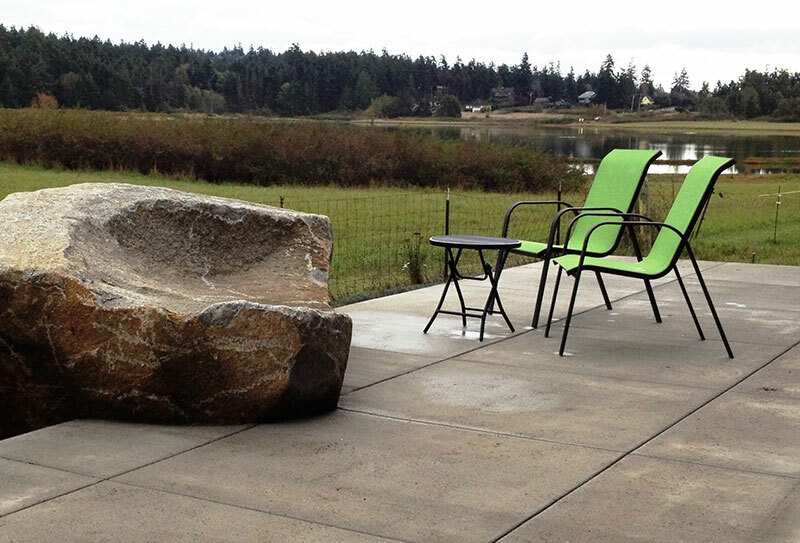 A large sitting rock softens look of otherwise minimalist patio of unstained poured concrete with a brushed finish. Large expanse of quince-colored poured concrete has a polished surface and saw-cut control joints. Most flagstones can be either sand set or mortared in place, and they come in random shapes or are cut to particular dimensions. 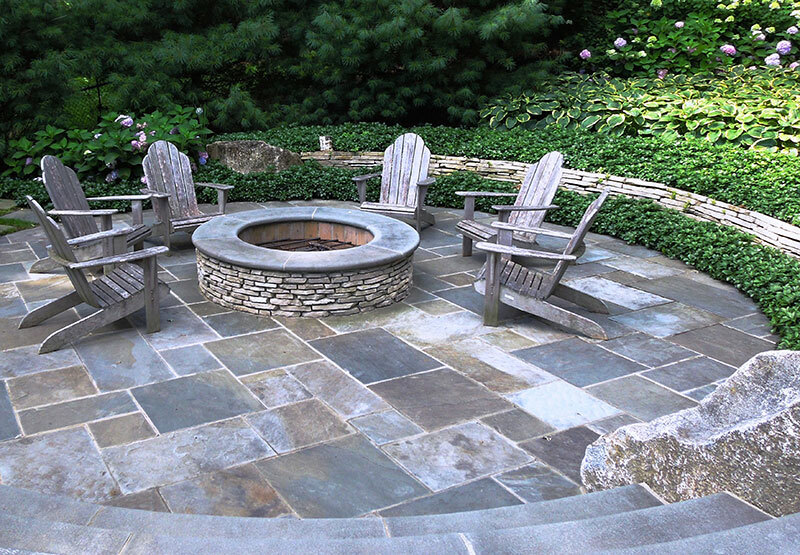 Sand-set flagstone should be at least an inch and a half thick, while mortared stone can be thinner. Deciding whether to use random or dimensional flagstone, or whether it should be dry laid or mortared will depend on the look and feel you want to achieve. Random cut, dry-laid stone feels rustic and informal, while mortared dimensional stone will provide a more formal look to your seating area. Often, paving next to a house is mortared and those more distant are dry laid. Random-cut stones are pieced together like a jigsaw puzzle. When sand set, they can have very small spaces between them or gaps large enough to grow groundcovers such as moss or thyme. In addition to flagstone, dimensional pavers are also available in granite and limestone cobblestones. These chunky stones vary in color, texture, size, and shape, from small square cubes to rectangular blocks, and from salt-and-pepper granite to charcoal black. Depending on the configuration of the space and the paver selected, a cobblestone patio can have an edgy, contemporary look or evoke an earlier time and place. The main difference between concrete pavers and natural stone is that one is a man-made product, while the other is found in nature. Also, concrete pavers come in specific shapes and sizes and generally are not available in random shapes. If you want the natural look of random flagstone, use it rather than a product manufactured to look like it. The real thing is about the same cost or just slightly more, depending on the stone selected. Other than that, the techniques used to build a concrete paver patio are the same as those used for natural stone, and just like natural stone, concrete pavers can be sand set or mortared. The decision as to whether to use natural stone or concrete pavers should depend primarily on the look you want to achieve. Concrete pavers come in a variety of shapes, sizes, and colors such as grays, browns, and tans. 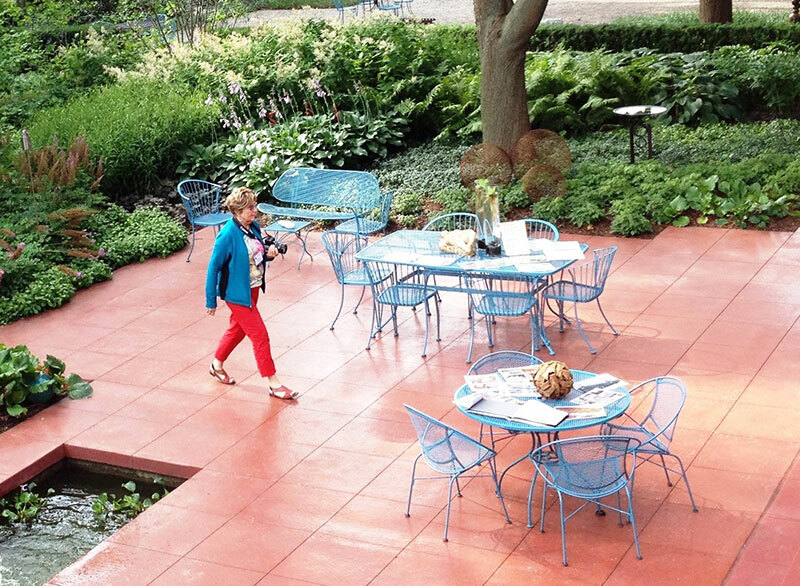 Among the choices are hydrapressed slabs, which come in rectangular shapes or in large squares measuring 18 by 18 or 24 by 24 inches and offer the cleanest and most contemporary look to a patio. At the other end of the spectrum are thick concrete pavers that are tumbled to look like old cobblestones. Other options for concrete pavers include a newer product that mimics wood planks and permeable options such as Eco-Stone, which reduces stormwater runoff by allowing the water to infiltrate through the gaps between pavers. Poured concrete might sound industrial, and there are many who appreciate a stark, industrial look, but it can also appear just as inviting as natural stone. Environmentally friendly stains are available that produce a mottled patina in a variety of shades from rich ochres and rusts to subtle grays. Sustainable sealers have varying levels of sheen to make your patio as smooth as marble or have a coarser texture. Poured concrete is most cost-effective for larger projects because the basic staging costs will be similar for both large and small projects. Besides those described in this article, there are numerous other options for the ground plane of your Seattle-area landscape, such as crushed rock, wood or composite decking, or even a dedicated lawn area. This article provides an overview of just three— natural stone, concrete pavers, and poured concrete. Visit the websites of Terrazzo Stone & Supply and Yellow Mountain StoneWorks for inspiration, along with additional information about some of these materials. Regardless of the product and technique, the sensitivity of your landscape designer to your site and aesthetics, along with the skill and care of your installer, are the most important factors in achieving a result that is both appealing and professional.